The Handbook: a Lifetime of Learning. The ARRL Handbook for Radio Communications is the most widely used one-stop reference and guide to radio technology principles and practices. 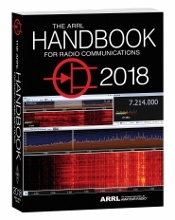 Since 1926, The ARRL Handbook has covered the state-of-the-art, but also emerging technologies in radio experimentation, discovery, and achievement. This fully revised 95th edition of The Handbook has been extensively updated, and includes significant new content. Each chapter has been authored and edited by experts in the subject. Radio amateurs, or “hams;” engineers working in radio electronics and communications industries; engineering (particularly Electrical Engineering and Data Communications), physics, and geophysics students. Plus, new and updated content on Software Defined Radio (SDR) and Digital Signal Processing (DSP), Grounding and Bonding, Solar Cycle 24-25, Tower Safety, and Building Remote-Control Stations. Download Included: eBook and Supplemental Material Download the fully searchable digital edition of the printed book, as well as expanded supplemental content, software, PC board templates, and other support files. System Requirements: The digital edition and expanded content (PDF files) are compatible with Windows 7, 8, or 10; Windows Vista or Windows XP, as well as Macintosh systems, using Adobe Acrobat Reader software. Acrobat Reader is a free download at www.adobe.com. PDF files are Linux readable. Other included software is Windows compatible, only. Hardcover: 1280 pages. Hardcover Edition also available.